Meghalaya is home to three major tribal communities, the Khasis, Garos and Jaintias. The Khasi tribe is a matrilineal society which means that the mother is the head of family, the youngest daughter owns all the property and the mothers surname is passed on to the children. Our driver and guide for the trip told us that women enjoy a lot of power in this community, are the primary bread earners and the dowry system doesn’t exist. Ah, the wonders of many Indias! Early British settlers called Shillong, the capital of Meghalaya, ‘Scotland of the east’ due to its similarity with the Scottish Highlands. Sadly, the main town area is anything but that now – the bazaars are overcrowded and noisy, the streets are dirty. However, you know there is truth in this statement when you travel from Shillong to Cherrapunji and revel in the beautiful landscape. The best way to reach Meghalaya is to land in Guwahati and drive down – the roads and connectivity is top notch. We drove from Tezpur, Assam (where I stayed in a tea estate) which is about a 250 km ride and very a comfortable one. There is an airport in Shillong but all flights go through Kolkata so this may not be the best use of time. I was in for a rude shock as we entered Shillong. Having read so much about the beauty of this place, I expected green hills, pretty huts and the works. 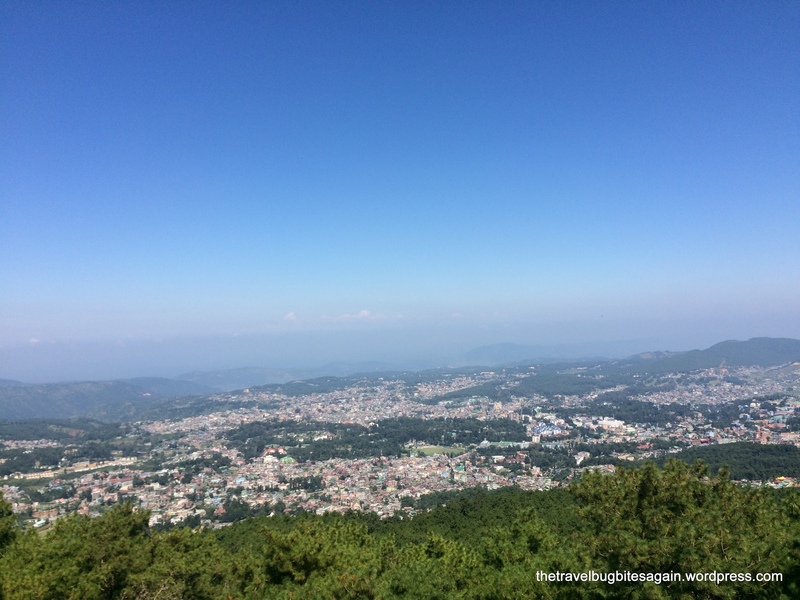 However, Shillong is now as commercial as any other hill station, overcrowded and noisy. Since it was Durga Puja time, hotels were scarcely available, we booked one in Polo Bazaar which was very disappointing. So I decided to do some damage control and look for another place. My recommendation would be to take day trips out of Shillong, come back in the evening, relax and maybe roam around a bit. If you don’t mind the crowds, check out Police Bazaar and Bara Bazaar (where the locals shop). I fancied neither. Barapani Lake – Created by building a dam in the Umiam River, Barapani (which literally means ‘big water’) dominates the Meghalaya landscape with its expanse and beauty. You can stop at the lake on the way to Shillong and enjoy a boat ride. No water sports activities were currently operational. Try a Khasi meal. 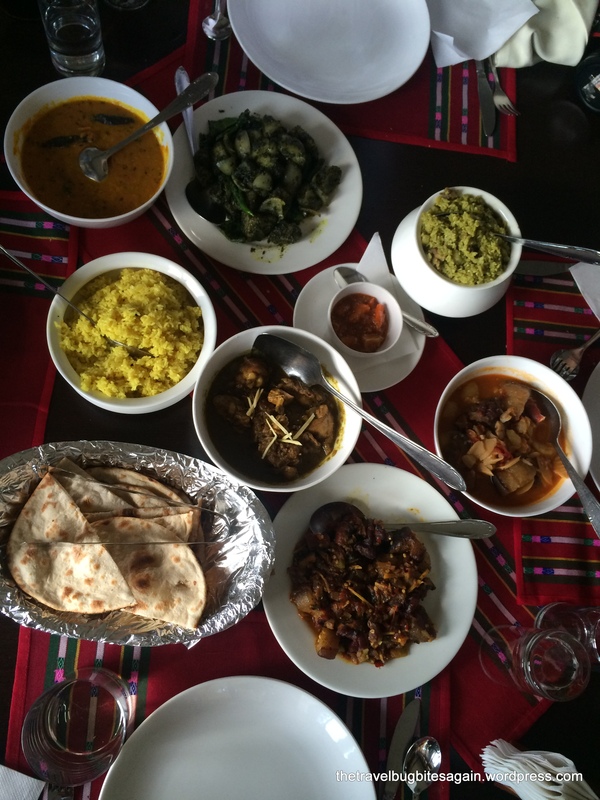 The feast below comprises of Cherrapunji chicken curry, Jadoh which is a rice pork dish, Bastenga curry (pork curry in bamboo shoots and potatoes) , Doh Thad Sdieh (another local dry pork dish), potato and onion in mustard and black sesame and Jastm (rice in turmeric, onion and ginger). Khasi food is rich and very spicy with a lot of focus on meat. definitely not for the faint hearted ! 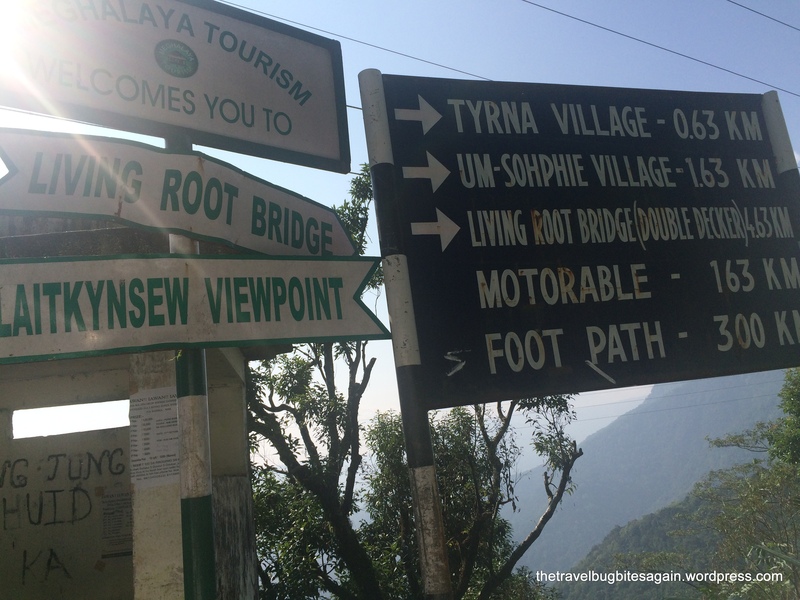 Trek to the living roots bridge. 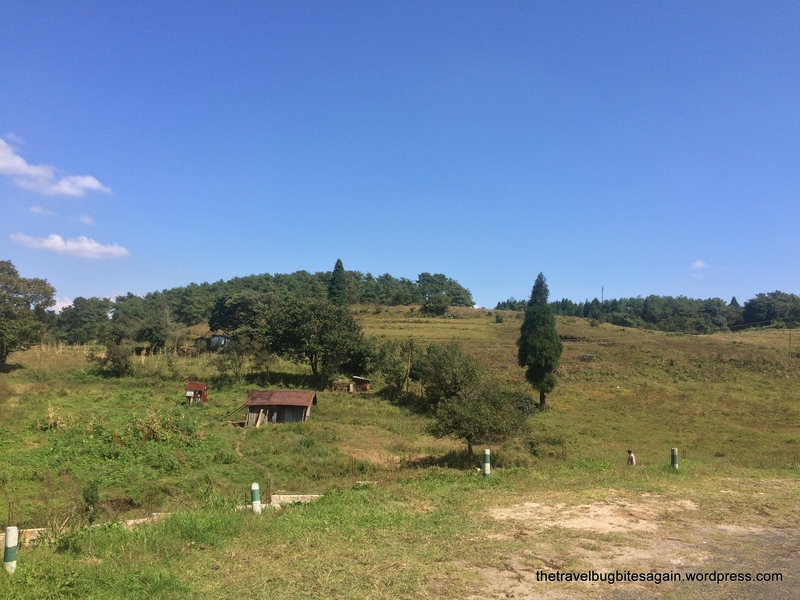 As you go past Cherrapunji town, the drive gets narrower and rocky, till you reach a small village called Nongriat. You will see signage leading you to the Living Roots Bridges. These bridges have been grown naturally by the Khasi people, from the roots of the Ficus Elastica tree and take decades to form. The strength of the bridge will amaze you, as it can hold thirty or more people at one time. You can choose from two options, the Long Living Roots Bridge which is about 1600 steps one way and the Double Decker Living Roots Bridge which is about 3200 steps one way. 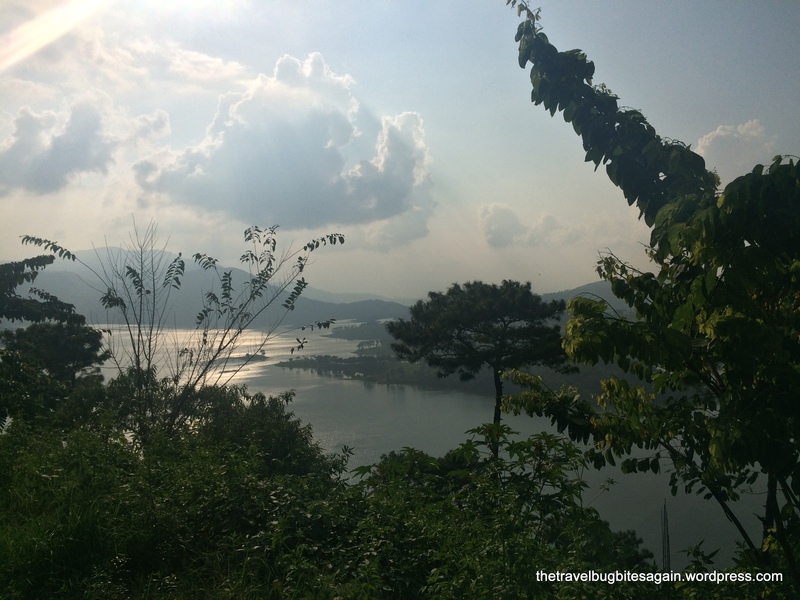 Since we didn’t have enough time for the Double Decker trek (it takes about 5-6 hours and it was already afternoon), we decided to trek to the Long Bridge. This was definitely the highlight of my trip, it is an exhilarating (and tiring) experience, but unique and totally worth it! Read more here . Cafe Shillong – You can’t miss Cafe Shillong on Laitumkhra street. Situated on the first floor, it has an easy, urban vibe. The sandwiches, burgers and coffee are great and they host live music nights we well. Munchies – Neighbor to Cafe’ Shillong, Munchies is a rustic open cafe, a counter and a kitchen really and stools and benches. Try their chicken parantha and mutton chop. Cloud 9 – I had heard a lot about this very uptown bar (in Centre Point Hotel) but had an average experience. It probably was the timing (it was Durga Puja and a dry day), the bar was totally empty and without music and people, things seemed somewhat amiss. Mawlynnong– Apparently the cleanest village in Asia and a couple of hours drive from Shillong, we ended up missing this for lack of time. Locals told me that the village is clean and pretty, but nothing very different if one has trekked to the Living Roots Bridges and seen the village around. 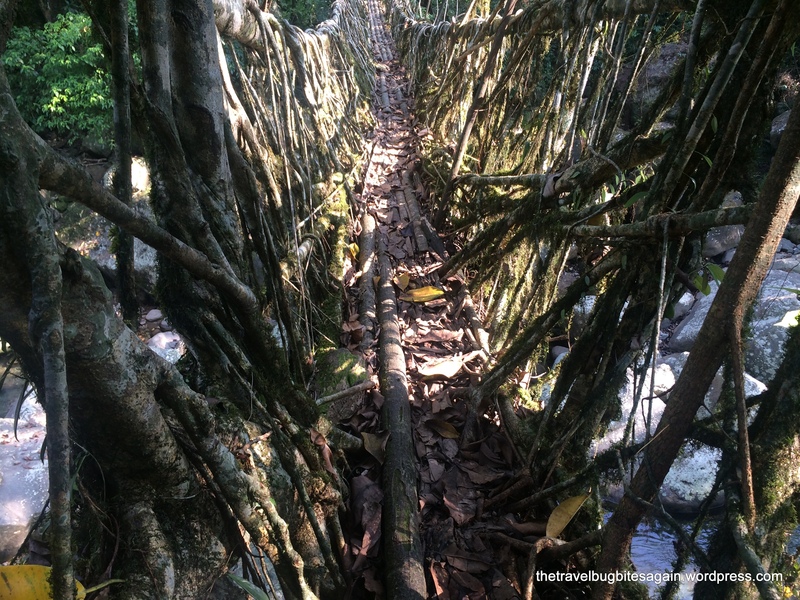 Mawlynnong also has a living roots bridge which is a far easier trek, plus a tree house for tourists to stay in. Shillong peak – This point offers a bird’s eye view of Shillong and is full of tourists clicking pictures. Though the view is pretty, I don’t recommend a special trip to this place. Just stop for a few minutes on the way to Cherrapunji if you really want a picture. 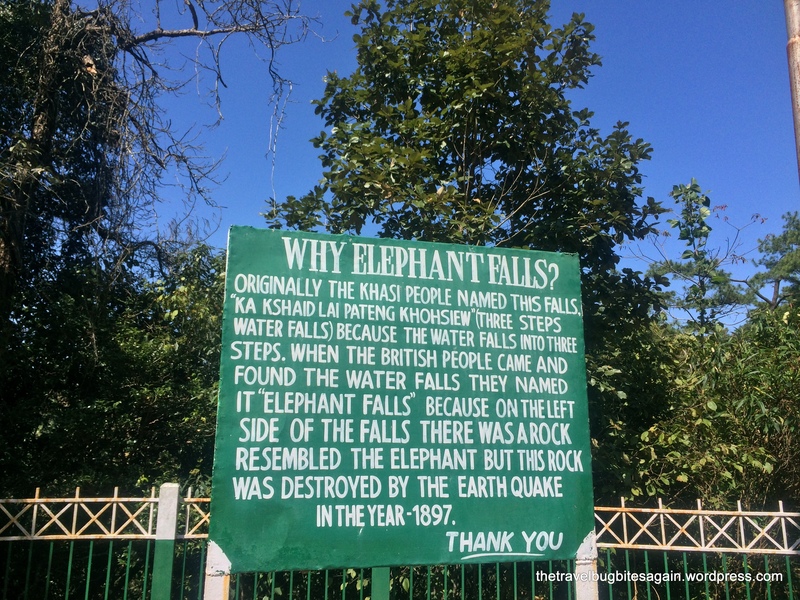 Elephant falls – Another prime tourist attraction in Shillong, catch these waterfalls only if you must ;). It is pretty but not a breathtaking experience in my opinion. Again, hordes of tourists and a photo opportunity at best. What was your impression of Meghalaya?